The father of Marvel Comic heroes, Stan Lee, created beloved comic personalities adored by the world, from Captain America to Iron Man and more. But who knew that the 95-year old legend always had a wish to create a Marvel character originating from China? On October 1, singer G.E.M. (邓紫棋) attended “Stan Lee’s Comikaze Expo” event in Shanghai, where it was announced that a new Marvel heroine will be created based on the singer’s likeness. While Lee himself was absent, a video clip which showed a meeting between the marvel legend and the singer from about half a year ago was screened. In it, Lee had complimented G.E.M., saying she had the makings of a comic character. “Extremely thrilled” and happy that she can be immortalized as a superhero character, G.E.M. spoke about all the qualities that she wished she would have, “All the supernatural abilities I can think of! Like the time-controlling abilities of Doctor Strange, or to be as rich as Iron Man, to leap everywhere like Spiderman.” G.E.M. added that Iron Man has all the qualities of her dream lover. 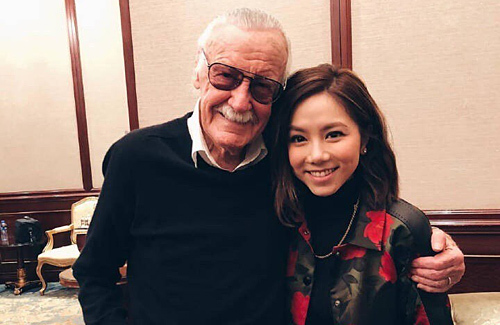 Stan Lee wrote on his Weibo account that he got to know G.E.M. on his previous trip to China, and was inspired by her vocals to create the blueprint of a new Marvel Heroine based on “the power of her voice”. He even invited fans and followers to brainstorm name suggestions related to jewels for this new character, whose tentative name will be “Jewel”. Fans have responded with “Opal” (cat’s eye) and “Amethyst” (purple crystal), among other suggestions. 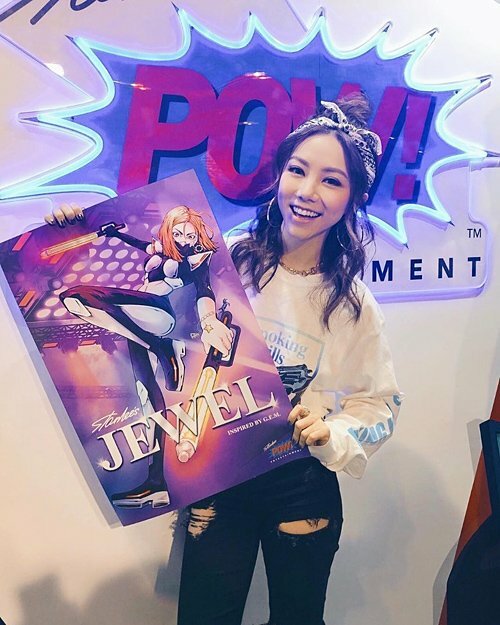 In the artwork unveiled, Jewel is seen with orange hair and dressed in the singer’s trademark leather leggings, while wielding two light sabers against the backdrop of stage lights, provoking speculation that the character’s profession might be a singer just like G.E.M. However, there has been no official word on what Jewel’s superpower shall be, and if she will be part of the Marvel movie lineup.